Indiana State University will introduce girls to careers in technology and engineering and offer them opportunities to mingle with industry professionals during an upcoming career exploration conference. The third annual FIT for the Future conference on March 30 - facilitated by ISU's Females in Technology and Rose-Hulman Institute of Technology's Society of Women Engineers and Girls in Electrical Engineering and Computer Science student organizations - will offer hands-on activities and networking opportunities for high school students. ISU students from the fields of aviation, computer and civil engineering, construction management, technology and engineering education, information technology, and packaging will serve as facilitators. Megan Jackson, a sophomore majoring in technology and engineering education, first attended a FIT conference when she was a West Vigo High School student. This year, she's leading one of the sessions. "I'm really excited to be facilitating a workshop designed to attract girls to my major," she said. Together with Sarah Marietta, a junior majoring in construction management, Jackson worked to recruit many of the 119 students registered to attend the conference. Those who attend will have an opportunity to meet technology and engineering educators as well as professionals from the fields of automotive, computer science, information technology and mechanical engineering. The industry specialists will discuss their career paths and experiences during small-group discussion sessions. The conference begins at 9 a.m. with an interactive presentation from keynote speaker Sarah Rodie, an ISU alumna and mechanical engineer for Alcoa, Inc. Sarah Fisher, professional race car driver and owner of Sarah Fisher Racing will share her experiences through a video interview conducted by two ISU students. Other guests include Jessica Campbell, ISU senior and Sycamore Flight Team's captain; Sonya Cho, operations management consultant at Alcoa, Inc.; Victoria Dunbar, ISU aviation technology department instructor; Odessa Pennington, ISU alumna and quality control engineer manager/environmental health and safety coordinator for Shutz Container Systems; Emily Randolph, ISU alumna from Unison Engine Components; Allison Terrell, Rose-Hulman alumna and graduate student from the University of Wisconsin; and Kris Whittington, Rose-Hulman alumna and software test engineer for Interactive Intelligence. Workshops begin at 10 a.m. Some of the workshops include: "Caution! Men Flying," an introduction to the cockpit of a small airplane and the ISU simulators; "Picture Perfect," an opportunity to use a variety of unusual photos to create a picture frame that will help sell the images; and "Oh no! Women Drivers," allowing the female participants to race CO2 dragsters, play on a hovercraft and test their reaction time with the Team Sycamore Racing drag tree. Workshops will continue until approximately 11:15 a.m. Students will have the opportunity to network with the industry representatives from noon until the conference ends at 1:30 p.m.
ISU's Females in Technology is committed to supporting the enhancement of women in technology and engineering through activities such as the FIT for the Future conference. The organization dedicates itself to helping students understand how they can take advantage of opportunities in the world of technology and engineering. For a full schedule of the conference and descriptions of the workshops, visit http://www.indstate.edu/tss/FIT/index.htm. Contact: Bev Bitzegaio, outreach coordinator, College of Technology, Indiana State University, 812-237-3575 or bbitzegaio@indstate.edu. 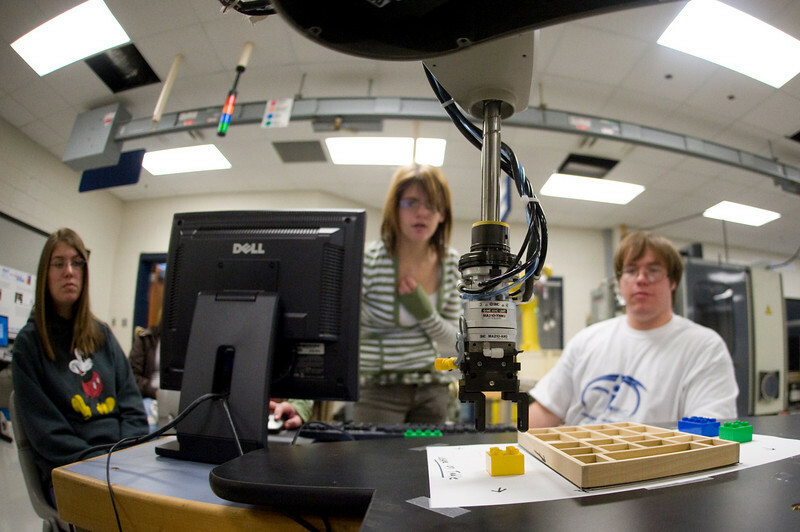 Cutline: Students from Wabash Valley schools learn in the Robotics Lab at Indiana State University's 2008 "FIT For The Future" Conference in the College of Technology.